The R15 TDI features a 5.5 litres (336 cu in) Turbocharged Direct Injection (TDI) turbodiesel V10 engine, rated at over 600 PS (440 kW; 590 bhp) and 1,050 newton metres (774 lbft) torque. 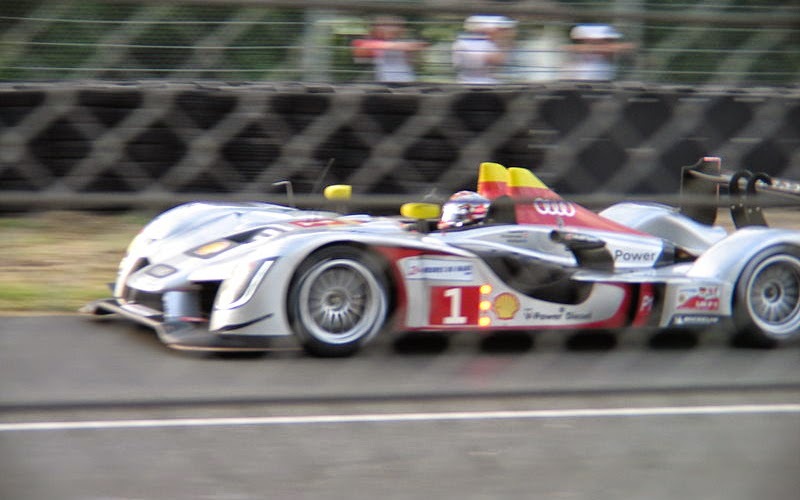 The electrical system uses a lithium-ion battery, a first for Audi sports prototypes, as well as LED headlights, and a unique system of LED rear lights that are mounted on the rear wing endplate. 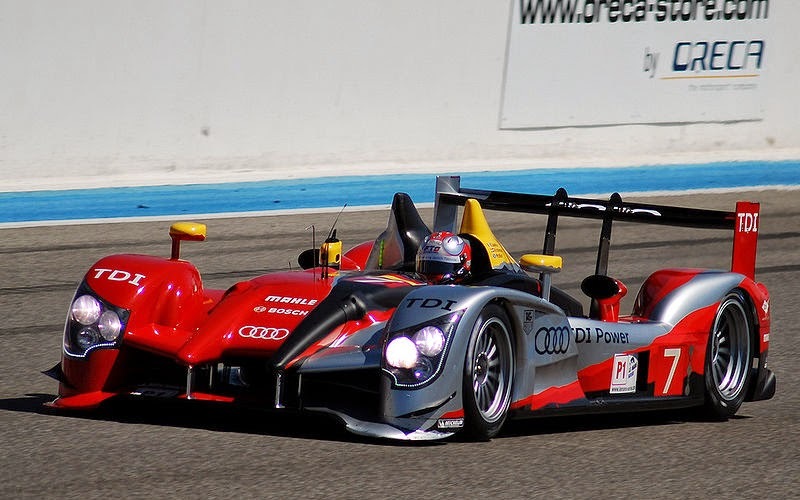 In response to losing the 24 Hours of Le Mans and the Petit Le Mans to the Peugeot 908s, Audi updated their R15 for the 2010 season, creating the R15 plus. 2010 Regulations reduced the size of diesel LMP1 air restrictors and turbocharger boost pressure. However, despite this Audi's engineering team led by Ulrich Baretzky were able to achieve engine power and performance that was comparable to the 2009 powerplant. Aerodynamic efficiency was also a major area of focus for 2010. The frontal area of the car was redesigned to reveal the raw crash structures. The front fenders were also lowered in an effort to reduce drag while the concept of air running through the car was abandoned for a more conventional design. The air channel that exited to the side of the car was redesigned resulting in a more conventional configuration, and a new headlight concept was introduced. Audi stated that they had improved the fuel tank and cooling system as well. The new vehicle was a success at the 2010 8 Hours of Le Castellet, winning 5 laps ahead of the next competitor Aston Martin. The Oreca Peugeot, which was supposedly its rival, dropped a full 8 laps down the order because the airjacks failed to come off. Audi continue to go flat out and in the end finished 10 laps ahead of the Peugeot. Audi had now been able to achieve both the speed and reliability combination that they considered sufficient to match the Peugeot challenge for Le Mans. A full squad of 3 cars was entered for the next race which was the 2010 Spa 1000 km, finishing 3rd (#7, behind the two Peugeots – No. 3 took 1st, No. 2 took 2nd), 5th (#9) and 12th (#8) respectively. 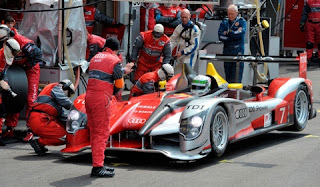 Audi treated the race as a setup exercise for car configuration at Spa that would then be used for the 2010 24 Hours of Le Mans. The 2010 24 Hours of Le Mans race got off to a tightly contested start with Peugeot occupying the top spots (as they did for qualifying) and for a large part of the race. However, it was apparent throughout the race that Audi were unable to match the pace with the Peugeots, but were working according to a different race strategy. By pushing the French manufacturer to the limit, three of the Peugeot cars experienced engine problems due to connecting rod failure towards the latter part of the race. With engine troubles for three of the Peugeots that forced the cars to retire before the end of the race, and an early exit by the No. 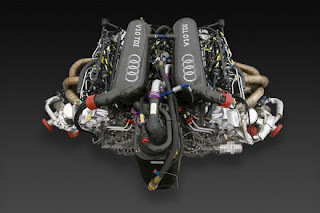 3 due to a suspension failure, the three Audis would finish 1–2–3 (the No. 9 took 1st, No. 8 took 2nd and No. 7 took 3rd), with all cars exceeding the previous distance record of 5,335.313 km (3,315.210 mi) set in the 1971 race by Dr Helmut Marko and Gijs Van Lennep: the winning No. 9 car, led by Mike Rockenfeller and two Porsche factory drivers Timo Bernhard and Romain Dumas, set not only a record-tying number of laps around Le Mans of 397 laps, but eclipsed the distance record outright at a distance of 5,410.7 km (3,362.1 mi). 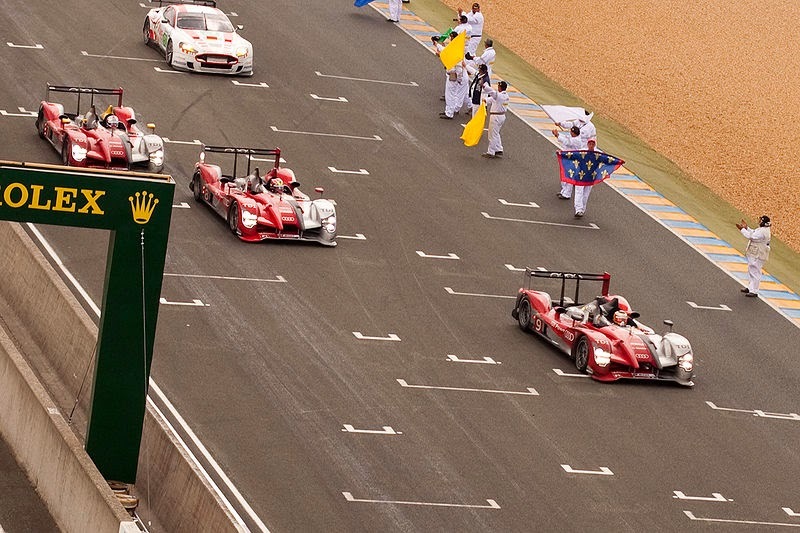 Post-Le Mans Audi did not collect any more victories and lost all 3 remaining races to the Peugeot 908, which happened to be part of the ILMC championship. Audi fielded 2 cars into the Silverstone 1000 km but the No. 7 crashed and retired. The sole remaining No. 8 finished 3rd. At Petit Le Mans 2 cars were entered but both lost to a Peugeot 1–2 victory. At the R15's last race, 2 cars were entered into the Zhuhai 1000 km. Both cars were leading the 908s by 30 seconds after Sebastian Bourdais make contact with a GT2 Porsche. A late safety car session saw the Audi's lead shrink to 13 seconds. Afterwards a controversial team-work by Peugeot saw the No. 1 908 slowed down the No. 7 Audi enough to let the No. 2 Peugeot come out of the pits just 2 seconds ahead. The race ended with Peugeot No. 2 winning 4 seconds ahead of the Audi. 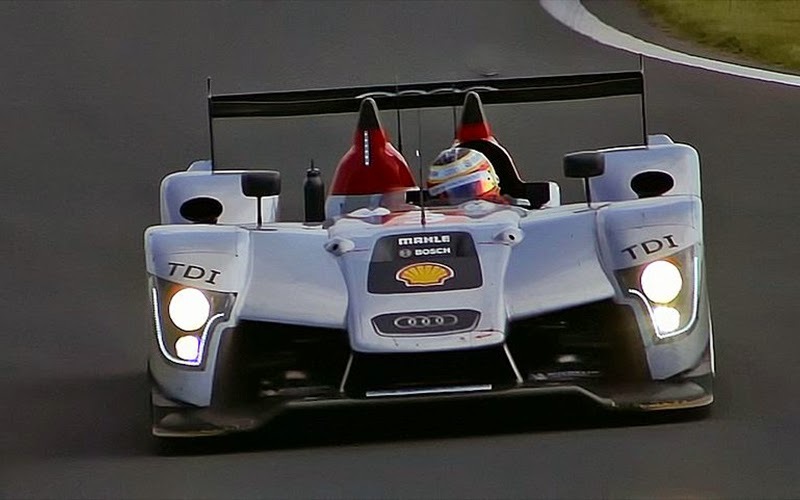 Audi did not win the LMP1 Le Mans Series team championship nor the ILMC LMP1 championship. The R15's final race was at the 2011 Sebring 12 Hours. Both cars ran in 2010 configuration with new restrictors. The No. 1 Audi finished 5th overall after 2 consecutive tyre punctures and rear bodywork damage in the hands of Mike Rockenfeller. Later in the race the No. 1 had to serve a penalty for speeding in pitlane. The No. 2 ran at the front exchanging the lead with Peugeot until a shunt by one of the Peugeots at turn 17 put Capello out of contention with a suspension failure. The No. 2 finished 4th overall, albeit 5 laps down from the winning Oreca Peugeot. Throughout its career the R15 won 3 of the 10 races it entered; Sebring in 2009, Paul Ricard and Le Mans in 2010. With a change in Le Mans Prototype engine regulations planned for 2011 Audi is working on a successor to the R15 TDI, known as the R18. In interview with Autosport Magazine, the head of Audi's Motorsport programme Doctor Wolfgang Ullrich stated that the R18 will be a closed roof coupe similar to the 908, however Ullrich did not state the car would be a hybrid or what fuel it will be running on. What he did state however is that one of the advantages of an open-top prototype has been lost with the recent regulation changes: open-top prototypes often shorten pit times compared to closed coupes; however with pit times slowed down due to new rules requiring only one man with one airgun in the pits, the advantage has been negated. The R18 would be Audi's first-ever coupe since the failed Audi R8C in 1999; the Bentley Speed 8 (which won in 2003 with Audi-developed engines) were also closed prototypes. 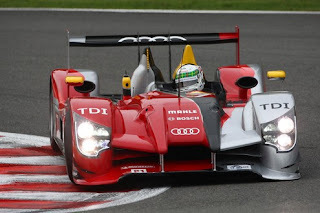 Along with the Peugeot 908 HDi FAP (replaced with a new generation 908), the R15 TDI will be replaced; however, due to developmental reasons, the R15 TDI made its final run at the 2011 12 Hours of Sebring under the R15++ configuration, where contact with other cars took them out of contention. Last updated on 2 May 2014 at 07:12.